I love the idea of a good short story anthology. It’s like a sampler platter, a way to get a taste of lots of different good things. If I like what I sample, maybe I’ll go in for a full meal one day. (That’s not to say that stories are lesser than novels—the full meal to come could be a novel, or it could be a collection by a single author whose story in the anthology I admired.) But I struggle to read anthologies. They’re not necessarily intended to be read straight through, but methodical person that I am, that’s what I do, especially when I have an anthology out from the library and thus have a reading deadline. Yes, I know I could check a good anthology out again, but how do I know it’s worth it if I haven’t read all the stories in it? I know, it’s illogical, but there it is. I enjoy reading short stories on my lunch breaks at work, and this book seemed like an ideal choice for our science fiction and fantasy month. 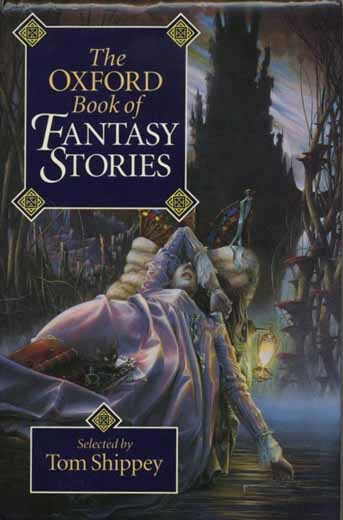 It contains 31 stories selected by Tom Shippey, a scholar of medieval literature and modern fantasy and science fiction. The stories come mostly from the 20th century and include such authors as H. P. Lovecraft, Ray Bradbury, Theodore Sturgeon, Mervyn Peake, Jane Yolen, Angela Carter, James Tiptree Jr., and Terry Pratchett. Having provided this context, Shippey dives into the stories, which are arranged in chronological order with no introductory commentary, aside from that which is included in the anthology’s introduction, which discusses some of the stories. I would have liked more details on the specific stories and authors and why they were included, especially since a lot of the stories in the first third of the book just didn’t seem very good. I don’t expect every story in an anthology to be good, but I like to get a sense of why the story is there. Moving on to the stories themselves, here’s what I’ve read so far. “Through the Dragon Glass” (1917) by Abraham Merritt. A gentleman adventurer brings a portal to another world back from his travels. When he enters that world, he becomes enraptured by the beautiful woman he finds there and vows to return to her, despite the danger of being hunted by the master of a fierce dragon. I enjoy the whole gentleman adventurer thing, but the depiction of Santhu, the object of his desires, got on my nerves, mostly because she’s never more than an object. “The Nameless City” (1921) by H. P. Lovecraft. Before this, I’d only read one story by Lovecraft, and I don’t remember anything about it. (I blog so I’ll remember what I read.) This story is an account of a visit to a mysterious and creepy city. It’s long on atmosphere and short on plot. The dreamlike atmosphere is really amazing, though. “The Wind in the Portico” (1928) by John Buchan. A scholar visits a mysterious house to see some old manuscripts. The owner of the house is clearly hiding something, and the narrator’s discovery of what looks like an ancient temple adds to his feeling of unease. A satisfying creepy story. “The Tower of the Elephant” (1933) by Robert E. Howard. Conan the Barbarian! I’ve never read a Conan story, and this one was fun. Conan, completely confident in his might and his skill at thieving, attempts to rob a supposedly impregnable tower. I don’t think I’d enjoy a whole collection of Conan stories, but this was sufficiently entertaining. A little long for what is was. “Xeethra” (1934) by Clark Ashton Smith. A goatherd finds a pathway to a past life and becomes discontented with his own and makes a deal to regain past glories. This story seems to be trying to get at some big life lessons about contentment and regret, but the lessons seemed obvious to me, and the great doom that settles on the main character is not especially terrifying—or at least not terrifying enough to warrant all the build-up to it. “Jirel Meets Magic” (1935) by Catherine L. Moore. My least favorite story so far, partly because on paper it seems like it should be great. It’s the first story in the collection by a woman, and the main characters are both women, but it’s so boring. A woman warrior named Jirel goes on a quest to defeat the wizard Giraud but comes up against the more powerful sorceress Jarisme. There’s a lot of chasing and mysterious happenings, but the story feels like it’s trying to hard to be serious. There are apparently several Jirel stories. I doubt I’ll read them. I almost gave up on this story, but it seems wrong somehow to give up on a short story. It’s just 30 pages after all. “The Bleak Shore” (1940) by Fritz Leiber. Wait. I take back my comment about Jirel. This may be my least favorite story so far, except that it’s really short, so it was over quickly. Some overconfident men are beckoned by death to a faraway shore, so they go. Terrifying adventures ensue. I just don’t get it. Glad it was short. “Homecoming” (1947) by Ray Bradbury. Now this is more like it. A little boy named Timothy feels out of place in his family. He has no taste for blood, is afraid of the dark, and hasn’t grown wings. A clever story that gets at some genuine truths about family life. So the verdict so far is that I’m not a huge fan of the sword and sorcery stuff, but I recognize that a few such stories are important to a collection like this. My favorite stories have some wit and humor to them and are often based in the real world. You can expect two or three more posts as I work through the rest of the collection. There are several authors to come whose work I’ve been eager to try, so we’ll see how it goes. This entry was posted in Classics, Fiction, Short Stories/Essays, Speculative Fiction. Bookmark the permalink. You will probably see more diversity in the latter part of the book. A long time ago I used to read yearly science fiction anthologies. The early ones were very close in type and gained diversity over the years as the genre developed. Now that I am thinking about them, I may have to seek out some of the old anthologies again. This sounds really good! I loved reading your synopses of the stories you’ve read so far. It sounds like an eclectic collection. I also like the idea of looking at the establishment of the tropes later fantasy novels were built upon. It might even be something my whole family would enjoy. I’m adding this to my list. The chronological arrangement definitely makes it easier to look at how the genre has developed. That’s the neat thing about collections like this.